While we had amazing experiences earlier in the trip, Day 12 revealed our physically largest surprise yet. Along with standing in a canopy platform, one of my other childhood dreams was to fly down a zip-line in the rainforest. Having seen photos of people zooming between the trees, I dreamed of soaring as free as the squirrel monkeys. So when I realized we had a free day planning the trip, I Googled up companies and picked one that also offered rock-climbing. But I was in for quite a shock when we arrived at the site. I expected an easy, short series of rock-climbs, followed by zip-lines between platforms on trees. Instead, a massive cliff rose up before us from the river valley, with no forest to be seen. Haley, our guide, explained that we’d be making our way up the via ferrata, a series of metal steps hammered straight into the rock face. While I was familiar with this type of steps from high ropes courses – we called them staples – I had never seen them used in rock. Once we reached the top of the ladder, we would be flying down almost a mile of zip-lines. While this scenario was far from my image, it sounded fantastically awesome. Thankfully, it was. However, we needed a bit of a safety primer. Unlike rock-climbing, we weren’t going to be on a belay line. Instead, we had two carabiners attached to our harness, which hooked into a cable. The cable was attached to the rock every few meters, so that if you fell, you wouldn’t fall any further than the last bolt. As you moved up the rock face, you moved the carabiners every bolt. While I was glad for the protection, moving the carabiners back and forth across 300 bolts got a little tiresome. Similarly, climbing up the ladder was easy – at first. It wasn’t nearly as physically demanding as rock-climbing, but I had never climbed anything nearly as long as this route. But the exercise didn’t matter when I got a look at the view. Every time we reached a new resting point, the scenery boggled me. With every increase in altitude, a little more of the landscape revealed itself. The valley unfolded before us, the river running in a thin ribbon below and the snow-capped mountains emerging from the horizon beyond. 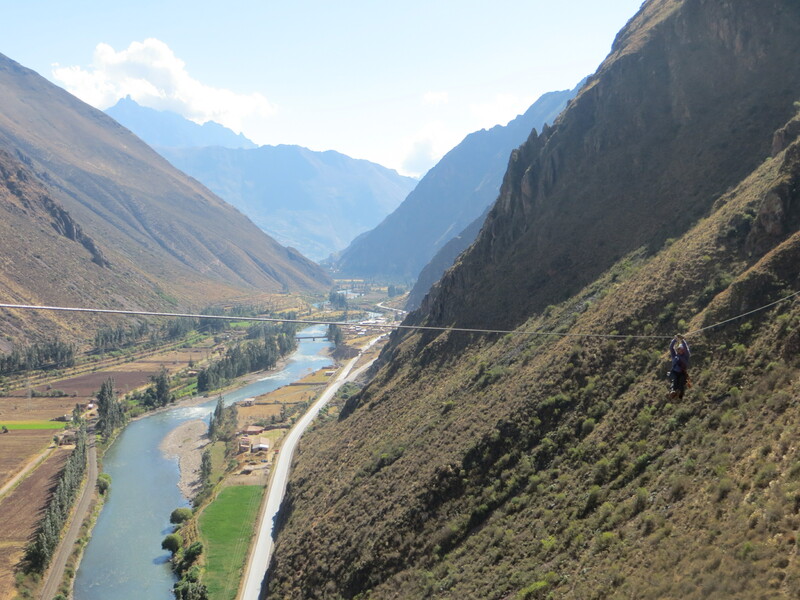 One of the most challenging parts of the experience was a wire bridge – two long cables connected by a series of thin horizontal one. Looking down, all you saw was those thin bits of wire and the brown valley so far below. Although I was hooked in and had wire handrails, my hands were shaking. I edged my way along the bridge a few inches at a time, one foot in front of the other. The guide called out to me, “Take your hand off for the photo!” to which I responded, “No!” I know my limits. In contrast, Chris managed to take one hand and foot off for the camera. I was impressed. After 800 meters up what seemed like the world’s longest ladder, we finally reached the top. As we waited for our guides to prepare the zip-line, we had the chance to talk a little more the other folks in our group. The conversation reinforced my lingering suspicion that there are a limited number of real people in the world, and the rest are NPCs. Bizarrely, this wasn’t the first time we had met them – they were staying at the Manu Wildlife Lodge at the same time we were! (We also ran into other folks from the jungle on the streets of Cusco.) We learned that while their home is in Seattle and they once lived in D.C., they had been staying for the past six months in Peru while the husband was on a sabbatical. Besides the D.C. connection, their lives paralleled our own in odd ways – the husband used to work for NOAA in the Climate Change division and the wife designs text and video in museum exhibits. We also chatted briefly with our guides. Another former Seattle resident, Haley was living and working as a guide in Peru after majoring in outdoor education, or what I might have done in another life. Americo was from Peru, had studied at a world-class mountaineering school in South America, and had actually helped construct the ferrata. While I’ve been on many zip-lines, including on the Climate Ride and in the Adirondack Mountains, they couldn’t hold a candle to these. The first big, hairy line was called The Beast. It was so long that we had to ride tandem to have any chance of getting across in the windy weather. While the bridge freaked me out, I was fairly steady going off of the zip-line. After all, once you push off the zip-line, there’s nothing to do but enjoy the ride! Haley hooked both Chris and I in, with him in the front and me in the back. I wrapped my legs around him, readied my hand for the braking action, and we were off. Because we didn’t both need to brake, Chris held the camera and took video as we flew through the air. And then we stopped. And started moving backwards, at least until I grabbed the cable as hard as possible with my gloved hand. Even with our weight combined together, Americo had to bring himself out hand-over-hand, hook his harness to ours, and drag us all of the way back to the platform. I couldn’t imagine how difficult it was for him to drag all three of us back. The other zip-lines were just as fun, although we went singly on the rest. The other names were just as colorful – the Arrow for its speed, and Saful, named after an over-enthusiastic guide who forgot his glove and ripped the skin off his brake hand. Flying down them into the valley took away my breath, leaving my body as joyful screams. 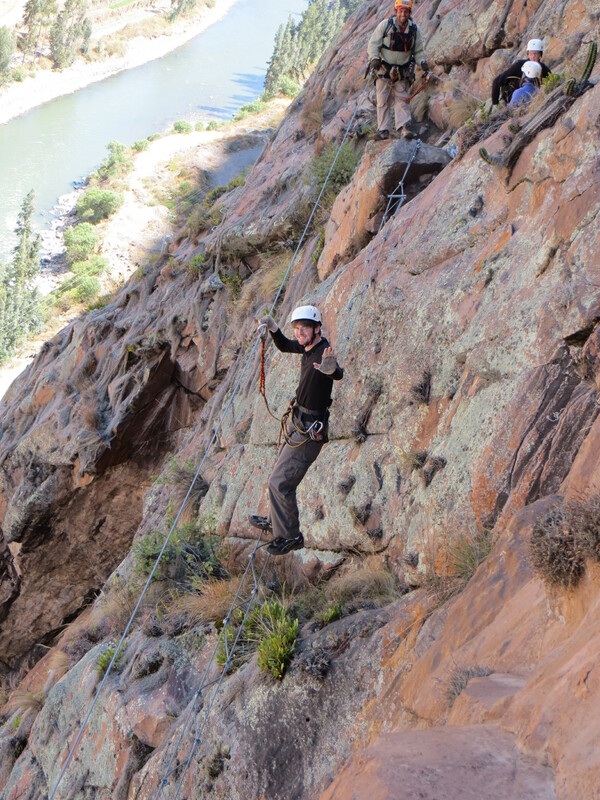 The last line was a combination rappel and zip-line, where I walked my feet down the cliff until the rock disappeared right from under me. Overall, it was a fast, beautiful ride. When we arrived back in Cusco, we decided to get some good food on our last day in the city. Chris ordered cuy (guinea pig) quartered and roasted, which was like rabbit but oilier. I had aji de gallina, a spicy creamed chicken dish with nuts, chilis, and potato. It was good, but I would have replaced the chicken with more vegetables. Perhaps I’ll try making it at home that way! That dinner wasn’t the only one I wanted to try at home. While in the jungle, we had quinoa in everything – pudding, soup, and salad. We also had a fruit with a hard shell that you cracked like an egg and looked as if it had caviar inside. Even the snacks were intriguing – different enough to be exotic, but still familiar. While I couldn’t bring any of it home due to customs limits, I certainly will be thinking about how to integrate it into my meals at home. 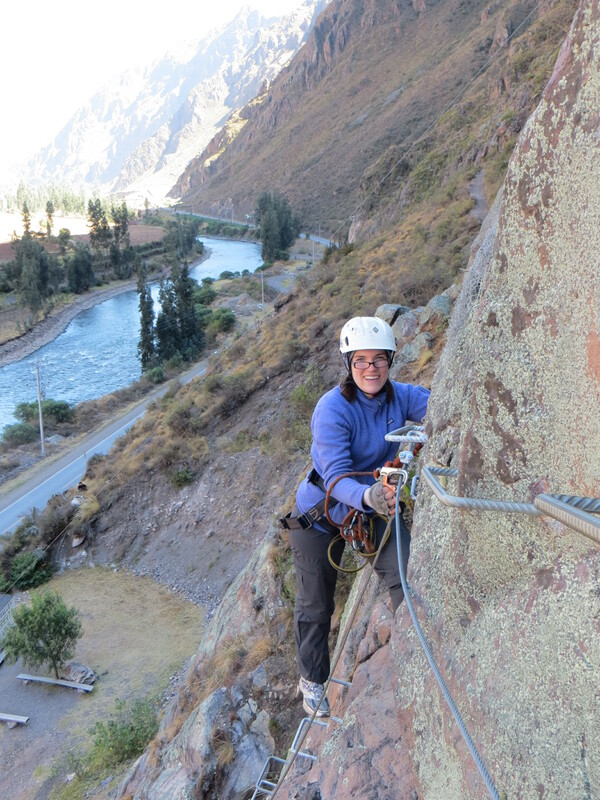 This entry was posted in family, travel and tagged ferrata, Peru, Sacred Valley, zip-line. Bookmark the permalink. 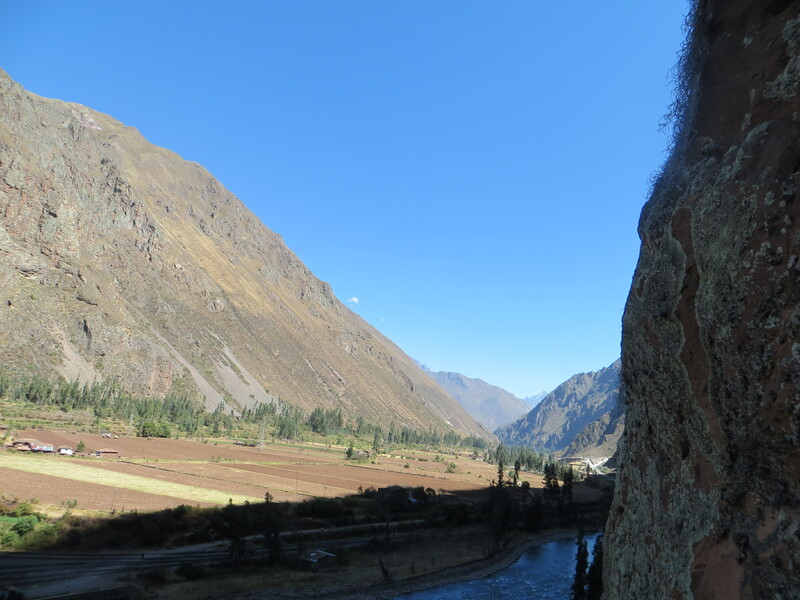 The Peru Chronicles: Day 12 | Will Bike for Change (or Pie!) , es genial, desde que os recibo no puedo parar de mirar todas vuestras sugerencias y me alegra cuando recibo uno más, sois lo mejor en español, me encata vuestra presentación y el curre que hay detrás. Un beso y abrazo,GRACIAS POR VUESTRO TRABAJO, nos alegrais la vida.